This looks delicious! I’ve saved it to my recipe file! Awesome, JL! I hope you enjoy it. The spiced beets sound really good. I might try those just on their own. And, as always, I love your pics. Another exquisite dish. I love the addition of pears and apples. And the colors of the beets and squash are gorgeous together. Thank you Rose! 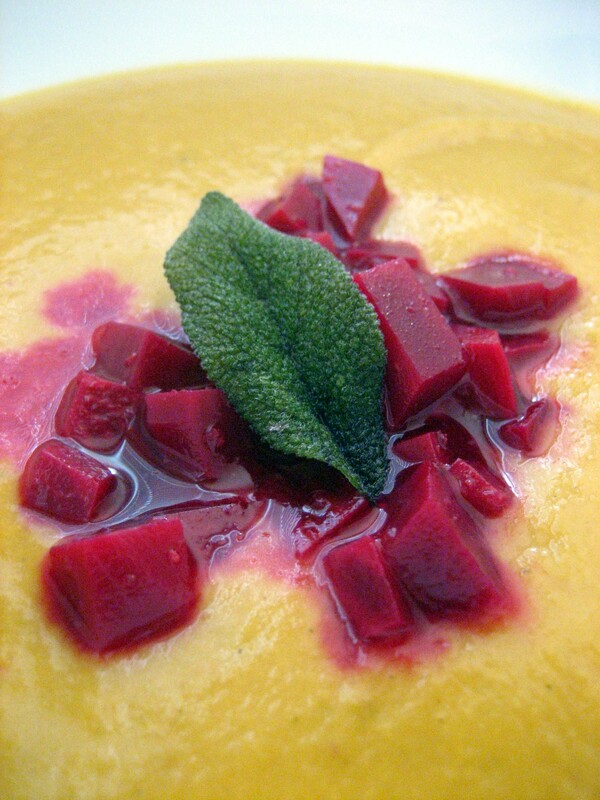 The colors were marvelous and the unexpected combination of the spiced beets with the soup was really nice. Hey, something to do with all those beets that keep showing up in my CSA boxes! You can only eat so many chocolate beet cakes. This sounds absolutely wonderful together and separately. I really like how you are using seasonal produce to make incredible dishes. Thanks for this post. Thank you Jill. One of my favorite things to do is to hover in the produce section and daydream with fresh and local ingredients surrounding me. Colorful plant foods = healthy foods!